Boost the immune system, activate and enhance immune system cells to effectively fight against illnesses, reduce the incidence of various types of tumours while serving as an early prevention of cancer. Lower the chances of atherosclerosis and cardiovascular diseases, like heart attack and stroke by reducing the amount of bad cholesterol (LDL) in the blood. Maintain optimum liver health and prevent liver diseases, promote liver cells regeneration to effectively remove toxins from blood. Boost brain health and enhance various cognitive functions for better learning, improve focus and memory, prevent Alzheimer’s disease, dementia etc. Make the eyes stronger and improve eyesight, reduce the risk of conditions like macular degeneration, cataracts, glaucoma etc. Reverse or slow down signs of aging, brighten skin while reducing wrinkles, blemishes and age spots; protect collagen from UV and oxidative damage. High anti-inflammation properties to reduce inflammation throughout the body and skin, reducing risk of degenerative diseases that involve inflammation. Add vigor and vitality, give the body more stamina and reduce fatigue, improve strength and enhance sleep quality. Prevent the development and complications of Type 2 Diabetes, regulate insulin and glucose, decrease insulin resistance to lower the risk of obesity, PCOS etc. Build and maintain bone structure and density, reduce calcium loss to ensure the strength and elasticity of bones and joints, prevent osteoporosis. Accelerates the body’s natural ability to detoxify from various pollutants and eliminate toxins from the body, boost digestive health by maintaining regularity for a healthful digestive tract. Science has shown that a diet rich in phytonutrients is able to stimulate the repair of DNA that may be responsible for aging and diseases such as cancer. surrounded by all sorts of pollution. killers worldwide and deaths are projected to continue rising. little to do with genetics and could actually be prevented. molecules from oxidation by free radicals. All testimonials can be found at MONIVITA™ official Facebook page, all comments are from our satisfied customers with their real profile. I become more energetic physically and mentally as well, my brain becomes more alert and I can think on my feet better. I usually take my supplements in pill form and they can be hard to swallow sometimes. 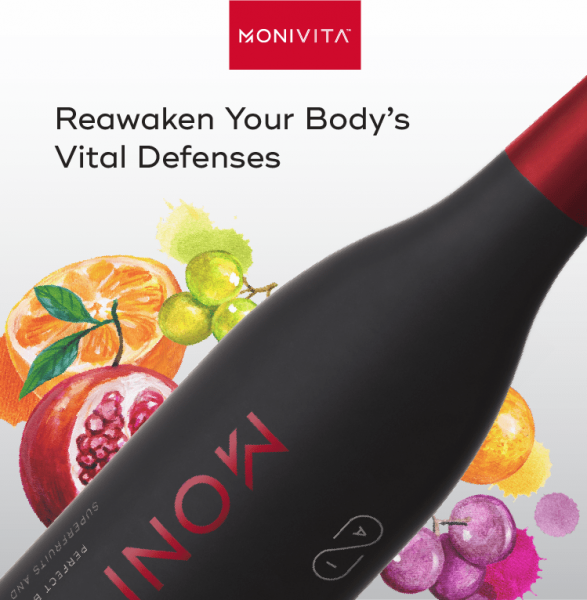 But with MONIVITA, I find myself looking forward to drinking it everyday. My nephew is autistic and has a very picky appetite. This drink is very nutritional and helps him get his vitamins. I freeze them in a popsicle holder and he enjoys them like a tasty popsicle. I've even gotten my whole family to drink MONIVITA regularly now. This drink is awesome and I no longer have constipation issues since I've started drinking it. I’ve been drinking MONIVITA regularly for over 1 month now and it not only benefit my health, but is also good for anti-aging by keeping my skin youthful and also improve my eyesight. The taste is really good! It gives me energy to be more focused on my work during the day. It is really a good supplement for a busy person like me. I noticed that my skin looks healthier, my hands and feet no longer feel cold at night and numb in the morning as I believe MONIVITA has improved my blood circulation. With MONIVITA, I begin to notice that I still have somewhat extra brain power and physical energy left for the things I love after work. I can’t wait to see what other positive changes can I get from this natural super tonic! 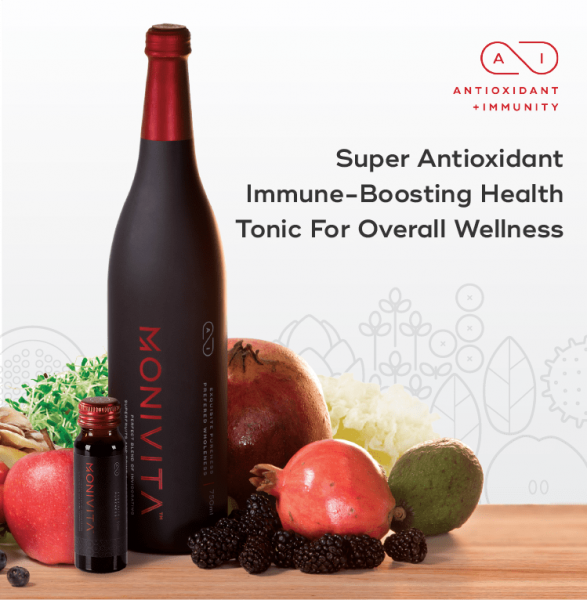 My eyes don’t get strained so easily and my energy level can be sustained at a consistent level even after lunch time, especially if I take a shot of MONIVITA during lunch time! Extremely rich source of vitamins and minerals, which can be about 50-120 times higher than citrus fruits. The antioxidant capacity is 20 times stronger than lemon, 3.5 times stronger than blackcurrant and 2.9 times stronger than wild blueberry. Highest antioxidant levels out of all vegetables. Highest amount of sulforaphane than any other cruciferous vegetable. In fact, 50 times higher than mature broccoli. Causes apoptosis or “programmed suicide” of cancer cells. Rich in fiber, 18 critical amino acids and polysaccharides, making them perhaps the most nutritionally rich berry-fruit on the planet and contain 2 to 4 times the amount of antioxidants found in blueberries.